Do we praise him or scold him? 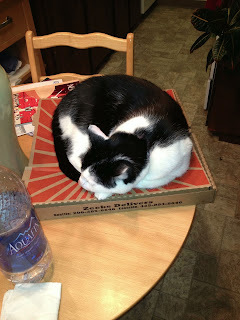 Yes, there's a piping hot pizza under there. And the delivery guy's vote is to praise him. Today marks the beginning of the 3rd trimester; yet another milestone that has me in complete disbelief. This past week has been a busy one for myself and the Beats. Last Thursday we had another ultrasound to check my cervix for a final time and to talk about the next few appointments. Seeing as our MFMs are at the university, it was also the first time that I had a medical student in the room with us. As the resident who's been following me since 14 weeks asked me the usual questions, I could see the medical student nervously nodding along. It was as they brought in the ultrasound machine that we learned that I was the first twins case she was sitting in on and she was worried I wouldn't let her do the ultrasound. The look of relief on her face when I assured her that I was completely comfortable taking a look at the Beats brought a smile to my face, as I know all too well that many people are not comfortable with medical students yet how important it is that they gain exposure and practice prior to going off to residency. Here's where the fun part happened: as the resident stepped out of the room to find the attending MFM, the medical student was scanning the twins, commenting on the boxing match that was happening. It was then that she turned to Grey and asked him if he wanted to try. Without missing a beat, he said "sure" and got his first lesson with the ultrasound machine. Anyway, the Beats are doing well and seem to be on track. We'll find out more next week with our first growth scan as to how well they are progressing. In the meantime, my cervix is holding at 3.5 cm. Outside of a severe case of constipation which landed me in L&D over the weekend to rule out preterm labor (another story for another time) and a prescription of daily Miralax and Colace, all is looking good. With all of this news comes the beginning of seriously preparing for the Beats' arrival. Last Wednesday we did our tour of L&D, learning about what to expect during birth and post partum. I was especially pleased to see a breast pump in each post partum room as well as know that we would have immediate access to lactation consultants because of the twins. In addition to doing the tour, we also had a weekend long crash course about pregnancy, delivery and managing multiples. The instructor for this course is an OB nurse at the university who has been teaching this course for 16 yrs. Though she is not a mother of multiples, she saw a need for this course after she found herself modifying topics for couples expecting multiples during normal birthing classes. Needless to say, the course was jam-packed with lots of great information, starting with how to recognize the signs of preterm labor, diet/nutrition and how important it is to gain the recommended weight (i.e. 38 lbs by 28 weeks), birthing multiples and what to expect in the delivery room (and that an epideral is almost required for the experience), breastfeeding multiples and where to find help (and why not to beat yourself up if you need to supplement) and finally tips for surviving the 4th trimester. The two most important things I relearned over the weekend where 1) that we're going to need help, hence I need to put aside my stubbornness and really begin cultivating where this will come from and 2) the term "Braxton Hicks" is misleading, especially for preterm labor. I won't spend much time with this, as there's a whole post one could easily draft on this topic, but I will say that a contraction is a contraction and the ones to be concerned about are those that happen regularly (6 or more an hour). In addition most preterm labor contractions are painless, meaning that many women who aren't aware of the signs and symptoms will easily miss this warning sign and assume all is okay until it's too late. We actually had one couple who are at 29 weeks and are currently on restricted has bedrest because of preterm labor 26 weeks. Initially they said it came on without warning, but as we learned about the signs and symptoms, she kept saying "OMG, I had that!!" and by the end of the class they made the decision to switch from their midwife to the MFM that was recommended. Since the course, Grey and I have been planning. I had already planned on stopping work by the end of July, but now I'm reducing my hours so I'm only working 3 days a week. We also now know that there's a limited amount of time left where I'll actually be able to help with acquiring the materials we'll need for the Beats, so we've begun transitioning our bedroom and the office area into living quarters for 4 human beings (we've actually been advised to skip a nursery as it's likely we'll be moving within a year). In addition, we joined one of the many multiples groups located in the Seattle area and have already been connecting with the group. The theme of babies after fertility treatments is a common one and many are more than happy (if not relieved) to share their journeys when they learn about our journey. The short and the long of it is that though I'm still nervous and worried about the worst happening, I'm also embracing that we have to prepare. To not do so will only lead to stressful consequences for all of us. Besides, I learned long ago from David that bracing one's self for the worst doesn't make that trauma any less and I owe it to the Beats to embrace the positives of this pregnancy. So begins the countdown. We're hoping for at least 9 more weeks of gestation. 9 more weeks means these guys will be full-term and no NICU. Come on, little ones: grow! 9 years ago today, Grey and I stood up in front of family and friends and exchanged vows. Naive to what the future held, all we cared about in the moment was being together. One year ago today, we hit our lowest point in this journey. Convinced our journey towards biological children was over, we found ourselves attempting to piece together all that had happened while trying to figure out how to move on. The pain from that day is still very real and will forever be etched on our hearts. The memories forever engrained in our minds. This morning, before running off to work, I laid down next to this same man and studied his face while he slept. So much has happened in these last 9 yrs, especially since our diagnosis. And yet, though we are both profoundly changed, I know how lucky I am to have found my soulmate. At the end of our wedding program, there was a story I first heard while taking an African Storytelling course as an undergraduate and both Grey and I immediately fell in love with its lesson. The moral of this story is simple, though not easy: A fruitful and blessed partnership will be one in which partners face life's struggles and impasses together; problems that are represent by the weight before the door. Never did I imagine we would encounter such traumas and the truth is that we're still learning daily how to work with one another to navigate our way through each and every single one of them. Yet I can't imagine any other person I would have wanted by my side through all of this. Happy anniversary, Grey. Thank you for climbing over the boulders of infertility/loss with me, being my partner through these seemingly impossible climbs. I'm so lucky to have found you and look forward to the next chapter of our journey together. After a time, the young man desired to marry, so, according to his father's last word, he went to the his father's friend, his guardian and informed him. The Guardian said, "It is well," and he set out and found a young woman. He made all necessary preparations, and caused a suitable feast to be prepared. The morning before the carrying of the bride to the groom, the Guardian called the young man and said to him, "Son of my friend, I have found you a bride. But before we may know that she is the one destined for you by Allah, it is necessary that you should do this. Tonight, after the bride has been brought to your house and she is seated in your room awaiting you, and before you go to her, I shall cause a heavy weight to be placed before the door of the room. You are to attempt to remove the weight. If she is the fitting wife for you, you will succeed; if you do not succeed, you will know that she is not for you and you should divorce her tomorrow without so much as seeing her face." The youth though, "I shall lift it with ease and won't wait to go in to my wife." But when he tired to lift the weight, he could not move it---no, not the breadth of a finger nail. He tried with all his strength to move it by lifting and pushing and rolling it, but in vain. Mantras. A word or group of words used for invocation or incantation. More famous examples of mantras are "Om," "I am that I am," "Ho’oponopono" and even "all you need is love." Mantras are embraced both in daily life, but especially during times of change or trauma. Mantras are known for their ability to inspire hope and resilience. In short, mantras are powerful things. But sometimes they can also be exclusionary. Back in 2011, I joined a mindfulness-based meditation group for those living with infertility. Grey and I were recently diagnosed and I knew that if I was going to make it through this experience with my sanity somewhat intact I was going to need help. Our group leader, Carol Knoph, is a fellow ALIer who resolved through adoption. Following her son's birth, she decided to train with Ali Domar in mind/body medicine for fertility and then started teaching courses to couples living with infertility/RPL in the Seattle area. It was through Carol that I met Dee and many of the tools I learned from this course I still practice daily. Needless to say, I'm still grateful for all her help and support. It was from Carol that I first heard "if you want to be a parent, you will be." As someone newly diagnosed with infertility, both Grey and I took great comfort from this mantra. It helped calm the panic that would arise after each BFN and it gave me the courage to dive head-first into fertility treatments. Later on, after our losses, this mantra supported me again as I began to explore adoption. In short, it became a rallying cry of sorts. Something that I could use to support others who were also struggling on this journey. But it wasn't until recently that I began to see the heartache this mantra could cause. Yesterday, S.I.F. wrote a powerful post about the myth behind wanting something enough. If you haven't read this yet, I really encourage you to click over and read not only the post but also the comments section. For the most part, I found myself readily nodding along. And then I came to the quote she posted from the discussion on Facebook and I froze. "I am empathetic to all of these concerns and difficulties. However, it is my belief that if you want to be a parent you will find a way. I am the momma of six one of whom is adopted." As S.I.F. dissected this comment and how it belittled those who made the decision to resolve by ending their journey towards parenthood, I found the tears readily flowing while I nodded along again. The whole time, I was chastising myself thinking "how could I have been so short-sighted?" In July 2012, I was convinced Grey and my journey to parenthood was over for the time being. Following our third failed round of IVF, I knew my sanity could not survive another round of fertility treatments on the assumption of "bad luck." In addition, we had just learned that no adoption agency would work with us because we were considering relocating for our careers. "Get settled and we'll talk" was what we were told, usually followed by "You're still young! Don't worry you have time." It was during this period that I first picked up Sweet Grapes based on the recommendation by Lori Lavender Luz. After finishing the book in a couple of days, I turned to other resources, both blogs and Pamela Tsigdino's memoir Silent Sorority. What I quickly learned was that the decision to live "childfree" (which is actually a misnomer as people who chose this way to resolve have children in their lives in some way) were not simply giving up on their dreams of parenthood. Instead they were making a decision to live and to live well. But most importantly, their decision to get off the infertility rollercoaster was not because they didn't want children enough. Far from it: they loved their families so much that they refused to sacrifice them and themselves in an effort to chase a ghost. Needless to say, I still learn from these women who write about their experiences and insights. It was because of them that I knew one day I would resolve, but that I would resolve to live a full life, regardless of whether I succeeded in becoming a parent. The truth is, as much as I wish each f you resolve by achieving parenthood, I also know that this isn't always the reality. Even for some who are open to adoption and expanding their family through this process, the reality is that simply going down this road will not guarantee success. Everyone's story is different and we all have obstacles that we will face differently in life. The any of us can hope for is to make decisions that will lead to outcomes that we can be at peace with. Here's where I'm struggling. There is power in mantras, yet there doesn't seem to be one that applies universally for anyone on this journey. I know that early on in this journey I wasn't ready to hear "one day you will resolve and move forward from all of this." Similarly, I would never dream of telling someone who knows that adoption will not be their road to resolution that "if you want to be a parent, you will be." In short, the mantras that have helped me, calling me to rally I know will cause others so much pain. But I hesitate to cease using them altogether as I know that sometimes these simple phrases are the only source of light in the darkness. Grey and I had a very long discussion about all of this yesterday. He was fast to point out that every mantra or rallying cry used for any trauma in life will inadvertently exclude a subset of the population (think anti-pink ribbons and the IV League, which is a support group for women living with stage 4 breast cancer). The thing is, though, the easy solution of stopping the mantras doesn't necessarily resolve this. By no means am I supporting the use of platitudes or simplified answers to the complexities of life, but I also know the power of mantras and how they've gotten me through these otherwise impossible moments. Needless to say, my mind is still spinning from all of this. I wish the answer was clear, that there was one thing I knew I could always say or do to ease the pain caused by infertility/loss. Hell, I wish I had the cure for infertility and RPL; that I could ensure anyone who wanted to be a parent could be. It's been awhile I know. I've been meaning to write to you, but have been overwhelmed with the ten-thousand details of my ordinary work and home life, with the blur of pre-Twinsanity (however, compared to infertility, I call this f*****g ice cream with butterscotch syrup). Heads up: This post gets a little nasty. If you've been through a lot recently, just skip it. It will be here later. Check in with yourself, then read on. Otherwise, go kiss your partner in life and know that you will resolve one day. Here we go with the me, me, me. 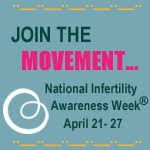 Infertility came at a vulnerable time for me (not that it comes at any particularly convenient time for any of us). Family was scattered (not that this item has changed) and there were unending issues. My professional life was cracking. What seemed like limitless prospects a few years before became almost equal dead-ends and embarrassing failures (like a gold miner coming up with rocks and donkey s**t). From a guy's point of view (ok, I'm a bit of a fossil, gender roles aside, this guy's point of view), this was failing his family. The neighborhood, our investment into the American Dream, went to crap. I could go into extensive detail, but it's ugly. One tale: while I had to go on a work trip to the other coast, there was an arsonist running loose in our neighborhood. They are finally, now 4 years later, rebuilding the shops this lunatic (yes, they got him, he is a lunatic) destroyed. Commence teeth grinding. Mmmm. Yeah, chip those molars, such a constructive habit (yes, I had one repaired recently). Then my beloved wife lead the emotional charge into infertility, me waiting behind, not even with my shoes on (huh...what??? whaddya mean infertile?? ?, nah...couldn't possibly be...we're from prolific low class breeder stock, infertility is a rich person's problem...yeah, I actually said stuff like that). I was angry at her that she had no sympathy for what was happening to me (oh, poor me) and it took too long to catch up and realize that more dear things were at stake. I had been worrying about failing a family that wasn't happening itself. The grey hairs in my beard came to mark the passage of it not happening in any timely fashion. I wrote these off. But they kept coming. We're not above the medical time threshold, but still they marked the time. A man getting older, a wife angry, a professional fizzle, no children. Yuck. I'd turn my back on me. Back then. When my head was full of sh**. Before infertility's gift. Infertility's gift came one profoundly painful day in the form of an envisioned granite stone. The day I finally mourned. After the losses. This couldn't happen. This couldn't possibly ever happen. THIS HAPPENS TO OTHER PEOPLE! But it did and to us. It was a material reality. And like has been said, sometimes life hits you with a f*****g brick. There is the macho interpretation of this. This is incorrect. Then there is the please-let-the-pain-stop interpretation of this. The second is what is really meant. I had named them in my heart. I saw their tiny headstones. Like those I have seen in children's graveyards. Except cuter and far more painful to me at the same time. I know horror mixed with innocence on a first name basis. I think I've written about this before. I don't want to go into it, but I've known chronic, physical pain that goes on for years. When it briefly visits to check in now it's "hello darkness my old friend" (macho style, our culture so values physical pain as a sign of masculinity). I've always hated you, but you remind me of when I was younger, and at the time I thought tougher, before infertility undermined what little I certainty I had in the world. The depression and grief of infertility was its match in magnitude away from normality in opposite directions. Seeing a white hot flare vs seeing blackness. But unlike the senseless physical pain I knew before (of unclear cause), this pain of infertility taught me some very clear things, things tied intimately with that which is good in life. I will not forget the pain of the loss so dear. It is too clear. I will never forget who was lost. I still want to cry when I play their song. This is an old song that I cannot share with you, I'm sure you understand, it's for them. I will never forget the grinding, to be followed by the yelling at, then the fear with and crying alongside my partner in life. We were destroyed. This is infertility's gift of pain. It taught me clearly what was precious, what was missing. It grabbed me by the balls and said: "Understand yet? Good." I will not burden the Beats with this. This is our burden. We may tell them of our story, but some details are for our interpretation. Our twins are on the way. I'm working to prepare. We toured the hospital today. There are material concerns, emotional concerns, health concerns. Some very limited professional success since those past days met with greater uncertainty today. But I know what I work for now. I don't want to die anymore. I want to live, I want to work, I want to fight. More importantly, I want to cultivate for our babies. I can and will fall short sometimes. But I can't quit. And for my beloved wife: I'm sorry I wasn't with you in those early days. I hope you agree I've caught up and I'm here now. We have since suffered together. For those readers who still suffer, you will resolve one day. If you want to be a parent, you will be. I am not condescending you. I am not minimizing your pain. I did not see the Beats coming, as much as I hoped. As I love these two, I see my friends who have resolved in vastly different ways, equally full of love and life. The clouds will lift one day. Sorry for the delay. Truth is I've been waiting to see to hear from the clinic too. Per instructions on Friday, we were running on the no news is good news philosophy with me being seen on Thursday for a bi-monthly check if there are no more bleeding episodes. Quick run down of Friday. We arrived at our clinic around noon, just in time to see my MFM heading off to a meeting. See told us that the lab slip was waiting for us at the front desk and that they would contact us if they wanted me to come in over the weekend or change my medication regiment. When I mentioned that He-Beat didn't seem to be moving as much, she told us to tell the receptionist so that they could take a peek. The receptionist immediately contacted the triage nurse and within 5 minutes we were whisked backed to the ultrasound area for a fetal non-stress test (NST). Usually the clinic doesn't begin this type of monitoring until after 28 weeks, especially with twins. But the nurse was feeling lucky and decided that we would give it a go. As she hooked me up to the monitor, she explained the purpose for each of the dopplers (one for He-beat, one for She-beat and one for my uterus to monitor contractions) and then proceeded to get some vitals on me. Warning us that locating the Beats could take some time, the nurse was really satisfied when she easily located both of them and was able to finish setting up within a few minutes. The jist of all of this is that both Beats are doing well, but we learned I have difficulty feeling He-beat unless he's low. That and She-Beat has earned the nickname "Busy B." After that Grey and I made our way to the lab for bloodwork. I'm still unclear exactly what they were checking, so I'll update when I learn the particulars. In the meantime, I'm taking it easy and focusing on other things. We'll see if Thursday results in any interesting news regarding the Lovenox. Until then, no news is good news. My heart always stops when I see posts that talk about bleeding episodes or bloggers having to end up in L&D. Vaginal bleeding is always scary and I still have nightmares from the episodes I had during my second miscarriage. This time is different, though. I'm not bleeding vaginally. I'm bleeding in places I shouldn't be, though and its the atypical nature of all of this that has my MFM on alert. It all started yesterday. Grey and I are both very stressed at the moment with my looming unemployment and trying to figure out how to manage the transition. Needless to say, I have a whole post I'm working on about all of this because it's seriously nonsensical that I'm in a position where I may not be able to receive unemployment simply because I'm pregnant with twins and may need to go on bedrest. Anyway, the stress has lead to a couple of meltdowns on my end. Something which I think may be one of the triggers. As a reminder, I am currently on daily Lovenox injections. To date, outside of the fact that this is still the most painful medication I've been on (yes, it even beats out PIO), I haven't had any side effects. So you can imagine my surprise yesterday while at work when I noticed a wet-spot on my black dress and when I ran my hand over it found blood. Confused, I excused myself from a meeting with a student and went to the bathroom so I could investigate in private. What I found was that the site of the injection was still bleeding. Not a lot, but it certainly wasn't stopping. Chalking it up to hitting a blood vessel due to stress, I grabbed a band-aid and went on with my day. This morning started out typically enough outside of the fact that Grey was up early working on uploading the final draft of a manuscript, so he was sitting across from me when I administered the Lovenox. 10 minutes later, I felt something running out of my nose and when I wiped I realized it was blood. Again, I wasn't overly panicked as I wasn't associating the bleeding with the Beats, but Grey took one look at me and immediately picked up the phone to call the clinic. Here's the concern: I don't have a history of nose bleeds. Add in the fact that the bleeds take forever to clot, resulting in a total of 3 this morning, and there's concern that my body is rejecting the Lovenox. At this point, I don't know exactly what all this means and/or if it's just a sign that there's been too much stress, but one thing that is certain is that this shouldn't be happening. There's another thing though. As strange as this sounds, I'm not panicking about this. If the bleeding was vaginal, I would be a complete mess right now. But the idea that it may just be affecting me has me shrugging my shoulders and thinking "as long as the Beats are okay, who cares." The most healthy line of thinking: probably not. But that's where I'm at. As I type this, Grey is showering and we're preparing to go in. Hopefully they'll have the results by today so that we know how to proceed. The idea of stopping Lovenox has me in more of a panic as I don't want to take away the one medication that I really think has protected the Beats from my wacky body. That said, I also don't want to jeopardize their health because I neglected my own. So it's a waiting game. I'll update more on this soon. Happy Friday, everyone! You've survived another week. This calls for an upbeat post. Blog awards always make me smile, particularly with the nominations coming from some incredibly amazing ladies. 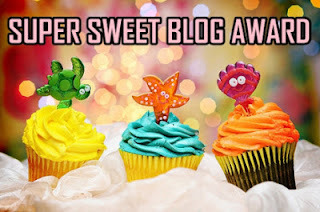 So I'm incredibly delighted be nominated not once, but three times for the Super Sweet Blogging Award. The first nomination is from Risa @ Who Shot Down My Stork? I found Risa's blog through LFCA a couple months ago and have been following her journey ever since. Risa is currently preparing for her first (and hopefully only) round of IVF, so go send her some support. The second nomination is from KelBel @ Tales from Our Yellow Brick Road. Outside of the fact I get to live vicariously through her travels to Belize, KelBel is also a pregnant ALIer who is literally at the same stage in your journey as I am. Too crazy and also a lot of fun to watch her progress. If you haven't checked out her pictures, I really recommend you do so. Plus she has the most adorable Golden Retrievers I've seen (outside of my MIL's ... but I'm bias). The final nomination is from Melissa @ A Place Where I Can Be Me. Though I've only recently found Melissa's blog, she is a resolved ALIer who previously struggled with unexplained secondary infertility. She's currently navigating the road of parenting after infertility. Stop by her blog and support her as she completes a 30 day blog challenge. I'm going to jump around a bit with this post, but will come back to answering questions and giving nominations at the bottom. Feel free to jump around yourself. Considering my sunshine-induced mush brain, it may make reading my rambling a bit more enjoyable. Over the past couple of years, I've eluded to the fact that I was born and raised in the Midwest. Unlike most midwesterners, though, where I was born was not where I spent the next 22 yrs of my life. My first two years of existence were spent straddling the borders of Ohio and Michigan, not too far from one of the smaller (and more polluted) Great Lakes. My parents then relocated back to my mother's home town for a couple of years before we relocated again to a small town where corn fields and farming were a way of life. I spent most of my childhood learning swimming in local lakes, getting lessons on how to drive combines, not worrying about locking doors and knowing that I needed to behave because everyone knew who I was and any misbehavior would quickly become foder for the gossip mill. It was my teen years that have had the most impact on me developing into who I am today. The summer before I turned 12 yrs old, my parents relocated for a final time to a metro area that straddles the fork of the Mississippi and Minnesota Rivers. Though I initially had trouble adjusting to the area, as suburbia and I have never really had a good relationship, I instantly feel in love the downtown area. As I grew older and became more mobile, my friends and I would frequently visit the Uptown area, loitering around the local coffee bars and various eclectic shops. And it wasn't long after that that the trips to First Avenue became very route, exposing me a new music scene that would ultimately become a staple when I relocated West. Growing up, I knew about Prince. More specifically, I knew the music. I remember dancing in rain puddles to "Batdance" and "Raspberry Beret", singing along to "Diamonds and Pearls," "When Doves Cry" and "Cinnamon Girl." Today, when I've feeling blue, "Purple Rain" is still a song I listen to to calm my fears and help dry the tears. The thing is, though, I never knew much about Prince as a person. Sure, there were sightings of a purple limousine that would drive around the Uptown area and rumors that if you stood in line outside his mansion, on certain nights he would invite the crowd inside to his private club and DJ a dance party that would last till dawn (btw: if anyone has ever done this, please leave a comment). But Prince the person; I knew nothing. A couple of months ago, that changed. While exiting the freeway to pick up my carpool partner, I hear a Prince song come on KEXP that I had never heard of titled "Starfish and Coffee". Upon first hearing it I laughed at the silliness of the lyrics, but throughout the day found it stuck with me. A couple of days later, when Grey was having a particularly nasty day at work, I purchased a copy from iTunes as a way to cheer him up. Though his initial response was "cute," it wasn't long before he was humming it too. A week later, he went off to a conference on the East Coast and planned on sharing this song with his nieces and nephew. Something fun for the family. And then we both started reading about Prince as the person. His musical genius and how he lived. And we learned that this seemingly eclectic man is also the father to an angel. That he knew the pain of losing a child. And just like that, as Grey looked at his brother and his family and he knew that this song was not meant for them. And so, though he spent such a wonderful time with his nieces and nephew, playing and reading, he brought the song home for our Beats and to be shared with other ALIers. Because even though it's a simple song, it's one that we both treasure. 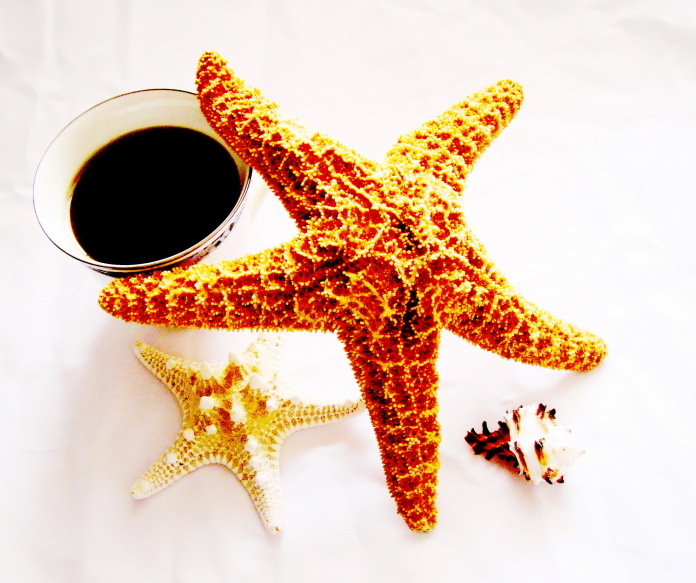 You can find the link to the YouTube Video of Starfish and Coffee here. Anything with Muppets makes it all the better. What Prince taught me that day waiting in line on the offramp is sometimes you just need a reason to smile. I'm sure we all had a Cynthia Rose in our childhood; the little boy or girl who did or said seemingly strange things, but who was also was the most fascinating person you'd ever meet. And my "Cynthia," though an oddball, certainly had one hell of an imagination and even exactly how to make everyone smile. I hope that one day the Beats will meet their own Cynthia Rose. Okay, back to the Super Sweet Blogger Award. 1) Thank the blogger(s) who nominated you: see above. 4) Nominate 12 other bloggers. 1) Cookies or Cake? I'm not one to discriminate, but I do lean more towards cake. Particularly Wacky Cake cause it's just that easy to make. 2) Chocolate or vanilla? This is where I'm channeling my inner Cynthia Rose: I'm a vanilla girl. Specifically, I like vanilla as a base. Don't get me wrong, I like chocolate with the best of them, but chocolate on chocolate on chocolate? A bit too much for me. 3) Favorite sweet treat? So the rumor is that the cupcake craze that's taken over the nation started in Seattle via Cupcake Royal. I can in no way verify whether this is true. But what I will say is that the city has three new obsessions: ice cream (Molly Moon's and Bluebird Creamery), pie (A la mode) and waffles (Sweet Iron). My favorite of these options? Give me a month, I'm still deciding. 4) When do you crave sweet things the most? All the time. Battling my sweet tooth has been a hard thing, hence the reason we also need to have fruit around the house. My cravings are always the worst at the end of a long day, though. 5) Sweet nickname? Growing up, my friends took to calling me solely by my last name. Mainly because hollering "Cristy" down the hallway resulted in too many heads turning. After Grey and I were married, that changed as my newly extended last name sounded way too much like the name of a well-known midwestern car dealership. But just as my nickname for Grey is Grey, he decided I needed my own. So he calls me "pussycat," stating that many of the mannerisms are cat-like. As of late, I have been renamed "klutzy pussycat." Finally, Blog nominations. I'm going to focus more (though not be exclusive) on newer/less followed bloggers for this one, but there are many, many wonderful blogs out that that I really encourage you to explore. Happy Monday, everyone! Quick note: as anyone who has tried to comment has learned, I enabled Captcha. I promise this will only be for a short while, but my inbox was quickly being filled with comments from spammers and after deleting 50 such comments on day I figured a week of captcha would deter them. Still, I know how much of a bummer captcha is (especially for those on smartphones), so I throughly apologize for the inconvenience. The sun is finally shining in the Pacific Northwest and everyone and their mother is playing hookie. Lots of thoughts have been circulating in my mushy brain since my last post, with a great post from a blogger I just recently discovered. Go check out her blog, as this one literally had me spinning afterward. Hence I need to process, but we'll pick up with all of that soon. For the moment, though, I want to segway into an area that is still underrepresented in the ALI community: the male perspective on infertility/loss. It's not to say that guy's don't have a viewpoint about living with this trauma (in fact, they are usually filled with thoughts, opinions and wisdom), it just seems that blogging isn't the forum they take to share their insight. Yet when the men of this community do take to the internet, their words are often profound. Recently, Jessie brought such a blog post to my attention. She notes that this is one of two posts from the author, with the one on parenting being widely circulated following being reprinted on HuffingPost. The second one, though apparently not quite as popular, is a gem. Certainly one that I plan on asking Grey for his opinion about. And yet, as Jessie pointed out in her post, it's likely this isn't something that will become dinner conversation for many couples. Mainly because not only is it taboo to talk about infertility/loss, but it's even more taboo if you're a guy. 3 years ago following our diagnosis of unexplained infertility, Grey and I found ourselves at a weird disagreement. While I was openly an emotional mess, I found him pulling back, putting on a facade of optimism and strength. It wasn't until years later that I fully understood why he was doing this, but what I can tell you is that all my pushing for him to process the continual trauma of failed treatments the way I was wasn't helping. Through counseling and a lot of reflection, I finally learned why Grey felt the need to be the "strong one." Reflecting on those conversations still break my heart. And it was only when he felt like he was safe to express himself and that he didn't need to be the one holding us together that he began to open up to how deeply infertility, failed treatment and our losses had been affecting me. Because of this, in the fall of 2012 I made the bold decision to give Grey my password to this blog and told him he was free to use this space to write it out. I mentioned it a total of 2 times and then made a very conscious chose to bite my tongue and not nag. As much as I wanted him to write it out, I also knew pushing him to do so would defeat the purpose. He had gotten the message. It was to my delight that he took me up on my offer for the anniversary post. But I had no idea about the second one until the following morning when I started getting the links to the comments. With both posts, I not only learned more about my partner, but also gained some insight into the male perspective of infertility/loss. Just as I have from other posts from the male perspective. What I've learned over the years, especially in those moments where men in the ALI community are able to talk about candidly is that infertility affects so many from all walks of life, but it does so differently. As time has gone on, I listened to Grey talk openly about our experience with colleagues, friends and even respected mentors. In a most recent interaction with one of these mentors lead to him sharing his own fertility struggles years ago, back when IVF was still relatively new. That type of conversation never would have happened between myself and this mentor and yet hearing about it filled me both with hope and pride. So, in addition to write out your anger, fear and despair about infertility, I'd love to hear more about the male perspective of ALI. Even if getting your guy near your blog is the farthest thing from reality, I still love hearing about their thoughts and insights. And, as I told Jessie, circulate the blog post from AP. It's not to say that his words on parenting are any less important, but this deserves some attention too.